It’s a great white cruise ship plowing across the Texas prairie. Or it’s a slender sliver of pockmarked stone climbing into the sky. Or it’s a wide grid of strength, challenging the other buildings for dominance of Power Corner. 1600 Smith is a great building all of these reasons. It’s asymmetrical shape allows it to look different from different angles, and its final geometry is subject to interpretation. It could have been a plain polygon stuck into the brown coastal plain like a discarded number two pencil. Instead, the architects at Morris*Aubry took one side of the pencil, and stretched it to a peak. Those who don’t appreciate the shape of the building will have to note its unique stature when it comes to signage. It’s the only skyscraper in downtown Houston with a corporate logo at the top. 2 Houston Center, also considered the gateway building to the Houston Center development, was completed in 1974 and occupies the full city block bounded by Fannin, McKinney, Walker and San Jacinto Streets. Allen Center was created in the early 1970s, when international-style suburban office parks were all the rage among urban designers. A grassy courtyard is surrounded by glass lobbies full of interesting things. One Allen Center and Two Allen Center were built to be almost identical. The aluminum-clad Three Allen Center and the glass-box Doubletree Hotel completed the main campus of the office park. The Enron Building, separated from the other four buildings, was first named Four Allen Center but really didn’t fit into the concept and is now known simply as 1400 Smith. A network of glass skywalks connects the lobbies of the three office towers with the hotel. The second-floor lobbies, wrapping around a grassy courtyard, always seem to have an art show going on. Fountains and sculptures fill the courtyards below, only seeing people on the coolest days. The skywalk between Allen Center and the parking garage is especially worth a walk-through. It gives some really good views of Antioch Baptist Church. MODERN, ELEGANT & SOPHISTICATED Are you are looking for a modern venue in which to entertain your friends or business associates? One that is hip and stylish, yet comfortable and inviting? Then fifty-two-twenty-six elm could be the perfect place for your event. Vibrant exterior architecture belies the modern, yet warm and inviting interior spaces. Floor-to-ceiling glass provides great views of the serene, inner-courtyard gardens with its stunning rose-covered pergola, coy-stocked meditation pool, and paths to meander through the grounds featuring a rock and waterfall swimming pool — all enclosed by a spectacular 20 ft bamboo surround. fifty-two-twenty-six offers a unique combination of indoor and outdoor spaces in which to entertain your guests. The stylish Courtyard Room looks out onto a beautiful courtyard, which can seat up to 70 persons for dining. The two areas also combine to create the perfect space for an indoor/outdoor cocktail reception. This allows you to host a pre-event cocktail party and then move to the adjoining Studio for a seated dinner. The versatile Studio also has 20 ft ceilings. It measures 40 x 60 feet and can accommodate up to 180 seated banquet style with a dance floor. This configuration is perfect for wedding receptions. It can also be configured as a ballroom with dramatic lighting, a dance floor and stage for a band. If you are just planning a cocktail party, we can comfortably accommodate 275 persons. Both spaces are suitable for virtually any type of event from casual to formal — whether sipping cocktails and nibbling on hors d’oeuvre, dining in high-style, or hosting more elaborate business oriented events. AIA AWARD-WINNING BUILDING fifty-two-twenty-six is well-known amongst Houston architects. The building’s innovative use of materials and elegantly designed interiors combined to win the American Institute of Architects prestigious “Building of the Year” design award for Texas. What other Houston event venue can say that? 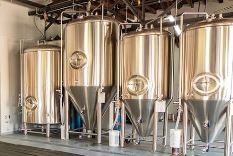 Makers of Fresh Beer and Fun Times in East Downtown Houston. 8th Wonder: it's the 1 you want. 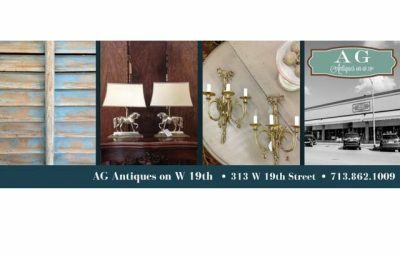 AG Antiques On W. 19th Located in the Historic Houston Heights @ 313 W. 19th Street. Alex Rodriguez Mercedes-Benz has a great selection of new Mercedes-Benz vehicles. Our pre-owned inventory consists of Mercedes-Benz as well as other brands. Our dealership is also home to an award-winning service and parts department. We are here for you if you need a new car, service, or parts.We have a state-of-the-art facility that allows us to compete with a clear home field advantage. Everything is under a single roof, ensuring a high degree of coordination between departments to give you a better overall experience. Our comprehensive service center is more impressive than most showrooms, with unrivaled services that exceed your expectations. You will appreciate the clear distinction from the moment you walk in.Our strong commitment to our clients has earned us the title of top Mercedes-Benz dealership in Texas with a 99% customer satisfaction rating. Movie Theater at Westheimer and Dunvale. Call 1-888-AMC 4FUN for showtimes. 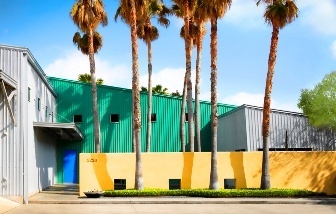 Anna’s Linens, headquartered in Costa Mesa, California, was founded in 1988 by its current president and chief executive officer. The company was named after his mother, Anna. Anna’s is the value leader in fashions for the home. The Anna’s Linens motto is to “Sell steak cheap, not cheap steak”. We provide merchandise at extreme value to our customers. Anna’s currently operates over 225 stores in 17 states, with over 2000 employees. Mackey Gallery began in 1997 with a clearly defined range of contemporary figurative painting and new media. Artists exhibited have included United States residents as well as artists representing international countries such as Cuba, Mexico, Guatemala, Haiti, Argentina, and China. These artists who have exhibited extensively have had notable exposure and visibility in the contemporary market. Mackey Gallery and its artists have been reviewed in several publications during these previous years and the gallery continues to forge ahead to obtain exposure for emerging and established artists. 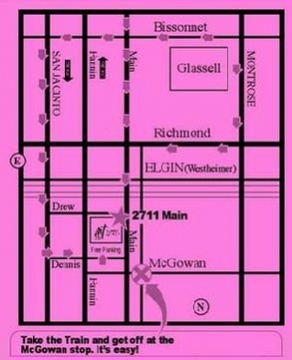 New Address as of August 2007. Architecture Center Houston (ArCH) occupies approximately 5,000 SF carved from the old Albert Thomas Convention Center in Phase II of the Bayou Place renovation developed by The Cordish Company. ArCH houses offices of the American Institute of Architecture, Houston Chapter, the Houston Architecture Foundation, a gallery for rotating architecture-related exhibitions, meeting rooms, and a terrace overlooking Buffalo Bayou. Architecture Center Houston is located downtown at 315 Capitol, Suite 120 on the corner of Bagby and Capitol. Parking is available in the Hobby Center parking garage located across the street with entrances on Rusk and Walker. The gallery is open Monday through Thursday from 9am to 5pm and Fridays from 9am to 3pm. ArCH exhibitions are free and open to the public. Advance scheduling is recommended for large group visits. Welcome to Art Supply on Main. We have been in business in Houston for over 50 years and are located in Midtown 5 blocks north of Elgin (Westheimer) and one block south of McGowan. We are 5 minutes from the museum district and 3 minutes from Downtown. Take The Train – We are at the McGowan station. 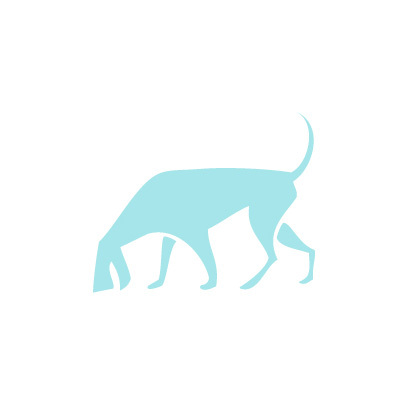 Our staff of working artists are ready to assist you with our full range of art supplies, graphic supplies, architectural supplies, and bookbinding supplies. We have 26 artsist studios and 7 loft style apartments which we lease to artists. We offer classes and workshops, as well as a classroom/Gallery which can be rented for your use. This venue is the Asian Pacific American Heritage Association’s office headquarters. Augusta Pines is an 18-hole golf club designed by Tour 18, Inc. The facility features a state-of-the-art practice facility (including six target greens, two pitching/chipping greens and sand bunkers). The course negotiates mature pines, dogwoods and oaks. The fairways and tees are Baby Bermudagrass, while the greens feature TifEagle. Augusta Pines’ dramatic finishing holes are back-to-back island greens, the par-3 17th and par-5 18th. A total of 30 acres of lakes come into play on 11 of the 18 holes. Houston’s most elegant banquet facility welcomes you to celebrate life’s most precious moments of Wedding Reception-Anniversaries-Birthdays and the like in a most memorable way. Our dividable-lavishly decorated ballrooms can accommodate from 100 up to 2500 guests. A spacious-luxurious lobby, tastefully furnished, make Ayva Center a prestigious place for your functions. Dazzle your guests with custom events in our beautiful ballrooms or intimate gatherings. Property Information 45,000 sq ft of total meeting space can be converted into 20 different size meeting or banquet rooms. Three side by side elegant Ballrooms: The Sapphire Ballroom, The Crystal Ballroom and The Platinum Ballroom. Attached club and concert hall can be added to the other elegant banquet halls. Completed in 1983, Bank of America Center is a 56-story, 1.5 million-square-foot office tower with an adjacent 12-story (125-foot-high) banking hall. The neo-Gothic building, designed by Philip Johnson and John Burgee, is clad in Napoleon red granite and reflective glass. The dramatic gabled roofline has become a major feature of the Houston skyline. Houston Galleria location of Barneys New York. Bay Oaks Country Club is a private Club dedicated to serving our Members and Guests. Established in 1988, the Club concept was based on fine amenities and country club tradition – unpretentious elegance with a sense of belonging tethering every facet of Member camaraderie.The Bermuda plantation-style clubhouse sits among moss-draped oaks and natural woodlands, creating a tranquil environment away from the metropolitan bustle. The 18-hole Arthur Hills championship course provides challenging play and an unforgettable trek into the native Texas landscape. Casual and formal dining come with superb, personalized service and sublime golf course views.The exquisite scenic balance between lush woodlands and wide open sky is surpassed only by the generosity of the kinship within the Club. Bay Oaks Country Club offers fine amenities, but it’s the silently discernible “welcome to our Club” that makes it a cherished Member haven.Our Mission:Bay Oaks Country Club will be one of Houston’s Premier Country Clubs known for its Personalized Service, Member Pride and Balanced Financial Stability. It will have a waiting list to join as a Member, as well as an Employee Partner.Bay Oaks Country Club is a place to meet new friends and strengthen ties with old friends. Come be a part of our great heritage and tradition. The Members and Employee Partners invite you to explore our facilities, services and value offered by our Club.We are conveniently located in the Clear Lake City community, just 20 minutes south of downtown Houston, Texas. 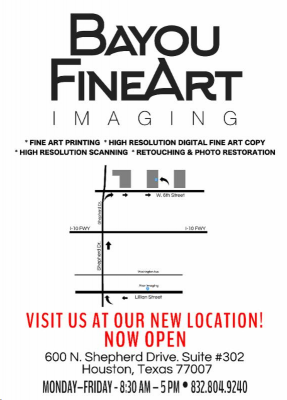 UPDATE SEPTEMBER 2017: THE LAB AT AKER IMAGING HAS MOVED & OUR NEW NAME IS BAYOU FINE ART IMAGING. The Lab at Aker Imaging has provided premier fine art and imaging services for over 20 years. This will now continue at Bayou Fine Art imaging! BBVA Compass is a leading U.S. banking franchise with operations throughout the Sunbelt Region and ranks among the top 20 largest U.S. commercial banks based on deposit market share. We operate 716 branches in Alabama, Arizona, California, Colorado, Florida, New Mexico and Texas. BBVA Compass ranks among the largest banks in Alabama (3rd), Texas (4th) and Arizona (5th). In addition, BBVA Compass has been recognized as one of the nation’s leading Small Business Administration (SBA) lenders, earning ‘Lender of the Year’ honors in 2009 and 2010.